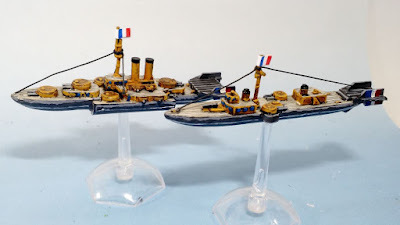 The second half of the french fleet that came with my kickstarter. 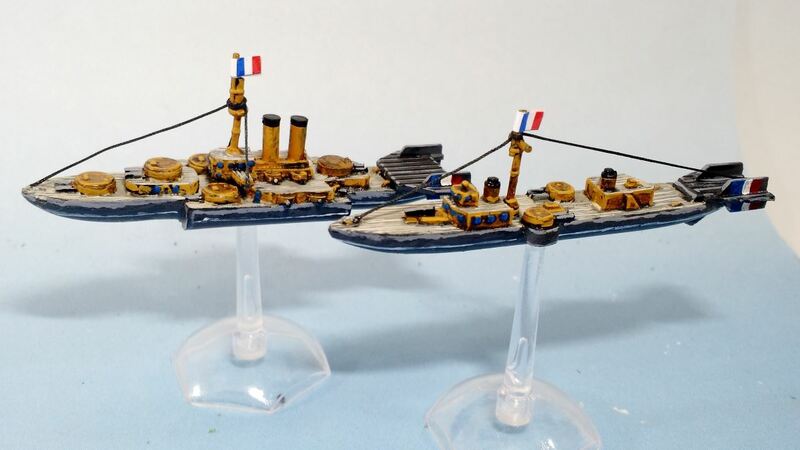 These are two cruisers are a Jeanne La Pucelle class, a Valiant class, and the Battle ship is the Charlemagne class. The latter has since been retired and remastered with some superstructure options and moveable turrets. I suppose this one probably is the 'actual' Charlemagne of the class as it's old and non-improved. Once again, I'm a little unhappy with the grottiness of the boats and the annoying guy wire ripping up the paint from the lead problem. I also struggle with deciding whether to glue the bases in. These ones have a tiny plastic plug that is hugely annoying when it snaps off in the lead as happens most frequently in any structural failure. Your airships are really striking. Well done! Thanks Jonathan. I was feeling they were looking too grubby for quite a while. I still question whether the big ship needs some better/lighter highlighting on the hull. I'm really digging these. The battleship looks especially nice. I vote not to glue the bases in. You'll just have to bore the plastic peg out when it inevitably breaks off. Don't know if this helps, but I like to use piano wire as stands for my flying critters. I paint the wire to match the playing surface I'm most likely to use the miniatures on. It looks ok and it won't break on you. Thanks Mr.Mouse. I've used nails before but, again, not entirely pleased with the result. I'm curious about the piano wire thing though. Do you order a specific 'note'/thickness? Is there much flex? How did you cut it? I bought some of these recently and they're great. 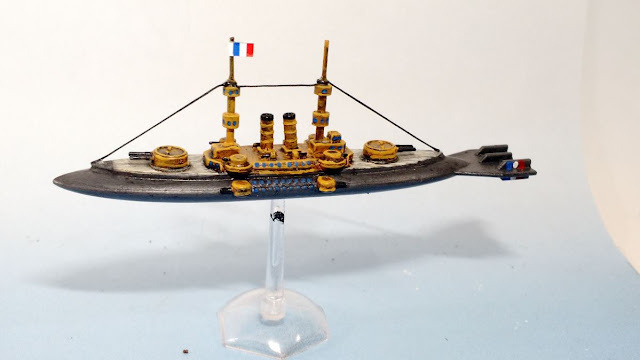 If your airships are about the same size as my GHQ WW II ships, one wire spear is easily strong enough to keep them aloft if you plant them in a sturdy base. You'll need wire cutters to work with the stuff. Those are some sweet airships. I like the French designs the best followed by the Brits. Such an interesting sort of alt-tech world, I always wish I had had some fellow gamers that were interested. Thanks Major. Funnily enough, the other fleet I got with the kickstarter was British. I figured it'd make sense to have some channel or colonial rivalry going. Or they could be allies if I got another fleet (eventually). I'm been looking at the aeronef thing for a long time, but lack of a decent ruleset (based on reviews) was a sticking point for a long time. I'll have to try and finish painting up my other fleet, and collar a gamer so I can report back with a game. Beautiful ships with impressive details! Thanks Phil. They are a fun subject and decent sculpts which definitely helps.